The practice of telemedicine is quickly gaining traction and the public is becoming more and more educated about the approach, but not everyone is aware of exactly what the term means and how it is used. 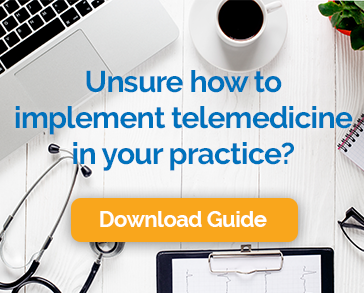 If you are offering this option to patients, you are wise to be well prepared for the question, “What is telemedicine?” Here are a few important points that we think you’ll want to remember to include in your answer. Telemedicine is defined as the remote diagnosis and treatment of patients using telecommunications technology. Basically, it means conducting visits using audio and video over the internet, rather than meeting in person. Telemedicine is part of a broader set of technologies called “telehealth.” Telehealth can refer to remote non-clinical services, such as provider training, administrative meetings, and continuing medical education, in addition to clinical services, while telemedicine is limited to clinical services. Next, you’ll want to describe the basic mechanics of a video visit. In practice, what this means is that we will schedule a video visit. You’ll open an application that has been designed specifically for this purpose, on your smartphone, tablet or computer that has high-speed internet access and a camera. I’ll open the application on my end, and we’ll be able to talk to and see each other. You can be anywhere with a good internet connection and enough privacy. The benefits of this approach might not be immediately obvious to patients, so it is a good idea to tell them why they’ll enjoy it. Our patients love this new option to have a remote visit. If you choose it, you won’t have to take as much time away from work, waste time in traffic, pay for parking or public transportation, make child care arrangements, or sit in a waiting room with people who might have contagious illnesses. We’ll make sure that your insurance company will cover this type of visit before we schedule it. A patient’s initial reaction may include concern about the effectiveness and confidentiality of this approach to care. You can provide a great deal of reassurance. Not all visits can be effectively conducted remotely. I will only schedule visits via telemedicine when the nature of your health concern lends itself to the approach. If something comes up in a visit that makes me feel that an in-person evaluation is necessary, we will make sure that happens. Studies have repeatedly shown that the health outcomes of video visits are just as good as those conducted in person. You can also rest assured, that we have selected a HIPAA compliant telemedicine solution that protects your confidentiality and provides for secure communication between just us. So the next time someone asks, “What is telemedicine,” just make sure to cover these bases. Your patient will be educated enough to make an informed decision about whether video visits make sense for them.